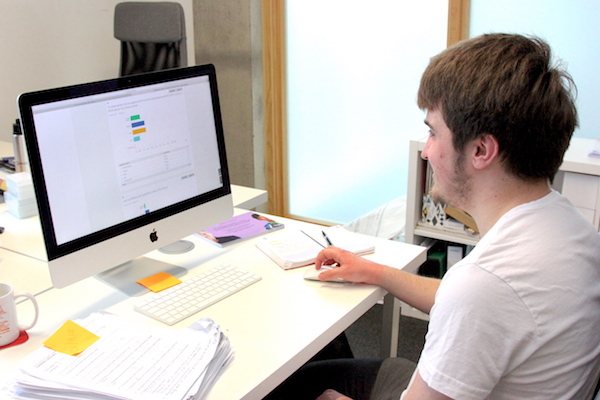 Form the Future were delighted to welcome 18 year old Ryan on a six-month work experience placement recently. He joined us in the office one day a week, whilst balancing his studies at Cottenham Sixth Form and a part-time job at Michael House Café in Cambridge town centre. We are dedicated to ensuring that students with special educational needs and disabilities (SEND), like Ryan, can gain valuable workplace experience that can help them to secure a paid job once they leave education. We were initially approached by his college to provide work experience for 7 weeks, but his lovely personality and positive attitude meant he soon become indispensable! As well as providing some much-needed support to our Events team, he was also able to assist the Marketing Manager and work on both our Mentoring and Cambridge LaunchPad programmes. We were very impressed with Ryan’s excellent work ethic and enthusiasm to learn new things. He was able to take on a wide range of tasks and responsibilities throughout his placement, including data analysis using SurveyMonkey, designing posters for events, managing the telephone switchboard, collating press cuttings and using the video editing skills he had learnt at college to produce a mentor training film. Undertaking a work placement doesn’t just enable young people to gain an insight into a specific job role or industry. It can also help them to learn new skills whilst building on existing ones, particularly transferable skills, such as multi-tasking, communication or organisation. Being employed is about more than earning money. It’s about feeling valued, independent and fulfilled. We were absolutely delighted to receive a heartfelt thank you letter in the post after Ryan finished his work placement with Form the Future. We were so pleased to hear that he found the experience memorable, enjoyable and useful, and wish him all the best of luck in the future. If your business is interested in providing work experience or internships to SEND students, we can provide support every step of the way. Contact us at workexperience@formthefuture.org.uk.